All of us seek to become more creative. We admire and envy those who create great art and music. But is it possible to become more creative? And is it possible to introduce creativity to our relationships, work life and spirituality? The course 'Kabbalah of Creativity' will answer these questions and uncover for you the mysitcal source of creative energy. Through textual study, exercises and discussion you will be shown insights and practical tools for unearthing your own creative energies in a lasting and meaningful way. 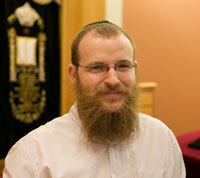 Rabbi Yisroel Dolnikov is the director of Adult Education at Chabad Double Bay. He has been studying Kabbalah, Jewish Philosophy and Law for 10 years (in Israel, the US and Melbourne). Additionally, he has studied Psychotherapy and Counselling at Graduate Level at the Australian College of Applied Psychology and is an Interior Architect as well as a saxophone player. His classes and lectures aim to enhance people's lives by building bridges between Jewish Mystical thought and the needs, hopes and aspirations of his audience.